Student veterans now have a dedicated spot on campus where they can socialize, connect with other vets and use a quiet study room with computer workstations. SF State celebrated the opening of the University's student veterans center, known as the VETS Corner, on Nov. 9. Congresswoman Jackie Speier and a representative from House Democratic Leader Nancy Pelosi's office joined members of the campus community to mark the official opening of the new space in Burk Hall 153-155. 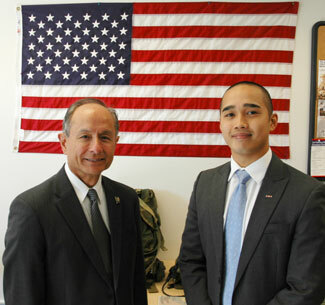 Student veteran John Sonza (right), president of VETS@SFSU, with University President Les Wong. The ceremony took place just outside Burk Hall in the Garden of Remembrance, which was decked out with yellow ribbons to honor currently deployed troops. The proceedings began with the National Anthem, sung by student Christa Laosantos. "The VETS Corner is a wonderful addition to the many services that SF State offers to veterans," said University President Les Wong. "We are proud to welcome veterans on this campus and we want to provide them with the support they need to succeed in their studies and beyond." "Today, we are here to thank SF State and our sponsors for honoring those who served and for providing us a place within our campus to call our home," said John Sonza, president of the student veterans organization, VETS@SFSU. "The VETS Corner will serve as a place for us to exchange and build upon ideas, and a place where incoming veterans can transition into civilian life." The group plans to host special events in the VETS Corner, bringing in guest speakers to talk to student veterans about such issues as health, stress and career planning. Special guests at the opening event included representatives from donor organizations. PG&E has pledged a gift to fund the furnishings and equipment for the VETS Corner, and support has also come from the nonprofit organization HomeAid Northern California. "PG&E is committed to actively supporting the military veteran community at many levels," said Ezra Garrett, vice president of community relations and chief sustainability officer at PG&E. "Part of that commitment is encouraging veterans’ educational endeavors, and we hope that our contribution helps the VETS Center provide a support network for these students as they build on their military experience to pave their career path ahead." Remarks were also given by Cheryl O'Connor, executive director of HomeAid Northern California, and Carla Goulart, chief operating officer at Sentinels of Freedom. The nonprofit organization Sentinels of Freedom is facilitating the gift from PG&E. The opening of the VETS Corner continues SF State's increased support for student veterans in recent years. Two years ago, the campus opened a Veterans Services Center providing pre-admissions counseling, assistance with benefits, academic planning and career counseling. Earlier this year, the University established a new veterans scholarship named in honor of House Democratic Leader Nancy Pelosi, and held a special graduation reception for veteran students. There are currently 377 veterans and 396 veterans' dependents enrolled at SF State, and the campus has been named one of the nation's top military-friendly schools by G.I. Jobs Magazine.